Vetus waterlock for exhaust hose with internal diameter 40mm, 45mm, 50mm, 60mm, 75mm & 90mm. Provided with a plug for draining over the winter. On the 40mm, 45mm & 50mm versions, the inlet connector will revolve through 360 degrees to enable easy installation of the exhaust assembly. LP Waterlock 40mm WLOCKL40R Vetus waterlock for exhaust hose with 40mm internal diameter. 360 degree revolving inlet connector. LP Waterlock 45mm WLOCKL45R Vetus waterlock for exhaust hose with 45mm internal diameter. 360 degree revolving inlet connector. LP Waterlock 50mm WLOCKL50R Vetus waterlock for exhaust hose with 50mm internal diameter. 360 degree revolving inlet connector. LP Waterlock 50mm WLOCKL50S Vetus waterlock for exhaust hose with 50mm internal diameter. Large volume is suitable for long exhausts systems. Fixed inlet and outlet connectors. LP Waterlock 60mm WLOCKLP60 Vetus waterlock for exhaust hose with 60mm internal diameter. Fixed inlet and outlet connectors. 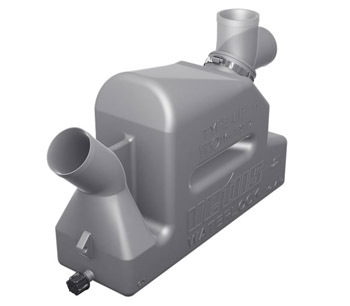 LP Waterlock 75mm WLOCKLP75 Vetus waterlock for exhaust hose with 75mm internal diameter. Fixed inlet and outlet connectors. LP Waterlock 90mm WLOCKLP90 Vetus waterlock for exhaust hose with 90mm internal diameter. Fixed inlet and outlet connectors.